There is a well-known 4-4 point joseki, occurring often in handicap games, which starts with a diagonal attachment. Most of the time, it is assumed that when the diagonal attachment of is played, then there should be a pincering Black stone at or in the vicinity to prevent White from getting a base. 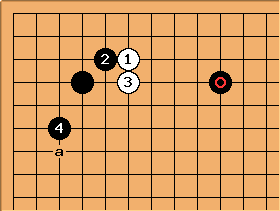 Note that the purpose of the diagonal attachment of is twofold: to make White heavy and to prevent the slide to G, and not an attacking move in itself (the attacking move is , see also attack from a distance). For a discussion when there is no pincer, see 4-4 point diagonal attachment, one-space jump (without pincer). In this joseki, the one-space jump at is neccessary for strenghtening the corner, so that does not simply become a weak player's diagonal. In other words, should not tenuki or play at a. See 4-4 point diagonal attachment, pincer (without one-space jump) for more discussion. Also, the diagonal attachment of and the one-space jump of doesn't protect the corner from an invasion. 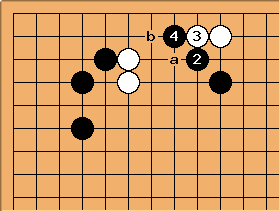 In fact, after the White stones have become strong, an invasion at 3-3 can be expected. and give some extra protection but no full security. See 4-4 point diagonal attachment joseki, 3-3 invasion for more. After , White a and b are more common. Sometimes, the slide at c is also seen, but c appears more often in handicap games than in even games. 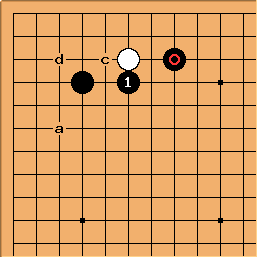 White d, e and f are sometimes played as well. 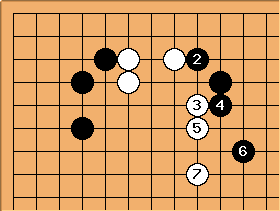 White may also choose to tenuki, or play a counter-pincer on the right of . We discuss some of the White plays below. The 4-4 point low enclosure at is not recommended, see 4-4 point diagonal attachment, low corner enclosure. Playing at a to form the 4-4 point large low enclosure is not recommended as well. See 4-4 point diagonal attachment, large low corner enclosure. The most common White play is the one-space high extension at . Typical Black responses are a, b and c.
The one-space jump at is usual, and typically will head towards the center. Later, if Black's potential on the right side is not big, then White can aim for a to c, which is big as an endgame move and for making life. The iron pillar at prevents White from getting sabaki. Typically, will escape. 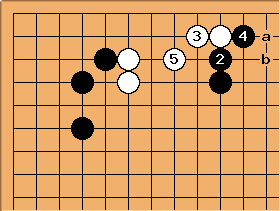 It may be that the potential on the right side is not so great, such that a move at a will allow White b to make shape and cause Black to be overconcentrated at the same time. 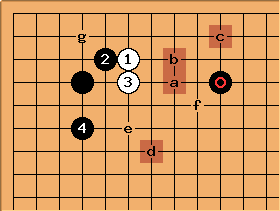 The attack at is also commonly played, but it allows White choices. White may choose to use the weakness of the diagonal to settle with a, go for immediate life at b, or jump out at c.
The most common reply is here. This gets White out into the centre and builds some influence. The price paid is that Black also gets strong on the right side. However, if Black is already very strong on the right side, can cause Black to be overconcentrated on the right side. Here, can also play the proper move shown here and go for immediate life, because a White move at a next makes miai of the two tiger shapes to form a second eye at the top. However, it also makes the descent of Black b attractive. Also, after , Black can play at c and allow White to escape with d. However, it should not be played automatically, but only if the area to the right is interesting and White d doesn't lay waste to a more important area. 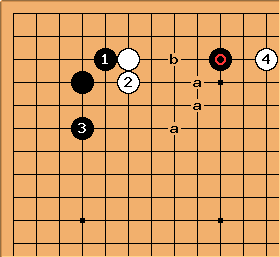 The low extension of is also commonly played, aiming for immediate life. Black will not let White to settle easily with the next move at a. Therefore, will be played to block White's progress. is a light move, and a typical joseki is up to . The slide at is more often seen in handicap games. The usual replies are a or b. The move at is the stronger of the two replies. After the crawl at , the should block. White can choose between a and b. If White cuts at , then to is standard. 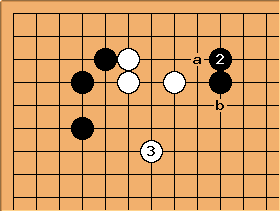 Later, White a may be answered at Black b (for a splitting attack) or Black c (for sacrificing the stone in exchange for a ponnuki). 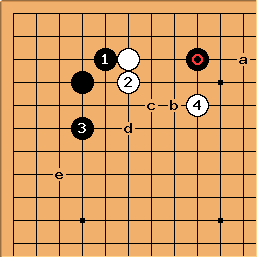 The clamp at connects, but up to , the entire White group has not even a single eye and have to face Black's attack. Although it may be possible for White to crawl at a to make one eye, but repeatedly crawling on the second line is painful. is the weaker of the two replies. After and , White has basically formed a base. However, Black has blocked White's progress into the right side. 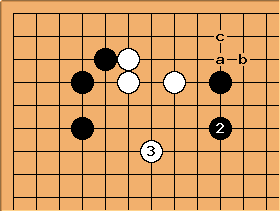 Note that before , White may choose to play at the clamp at a or the peep at b. 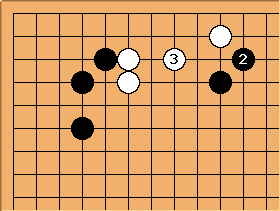 Black should not play passively at and allow to form a base, thus losing the chance to attack the White group. The large knight's move at is occassionally seen, and aims at speedy escape to the center. However, forces to patch up. Therefore, is seldom as good as a one-space extension. If White occupies the upper-right corner, then White may want to play the counter-pincer at . In this case, Black and White has one weak group, and both groups will run to the center. Here, if is played at the usual one-space extension at a instead, then will surely play at b, gaining a base and making a corner approach, killing two birds with one stone. 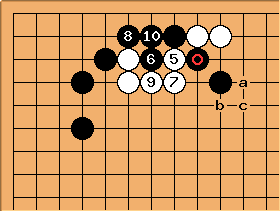 The White tenuki against the 1-space low pincer appears fairly frequently in modern professional practice. At the same time, the Black 3-space low extension also appears often against a White stone or stones in the upper right. White will often end up invading this extension later in the game. In any case, Black's two most frequent continuations are the attachment on top ( ) and the low extension at a above. The diagonal attachment is a distant third while the 3-3 play at d is an interesting alternative that is currently (2005-2006) being experimented with. Black's fundamental challenge with this position is to avoid playing on too small a scale. 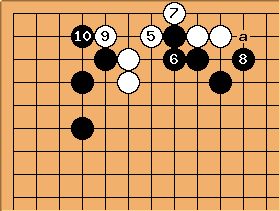 When Black plays the diagonal attachment, White will often tenuki again. In such cases Black may leave the position as it is for now or play at 2. When White responds with and follows, the two main choices for the are the diagonal play show here and the attachment at a. 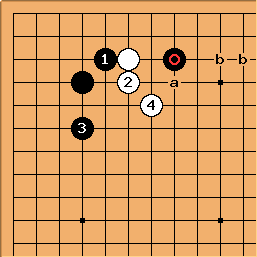 If there are close supporting stones around b, White usually attaches at a. 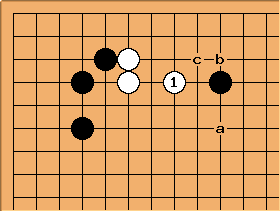 If there is no close support, White usually plays the diagonal . The 2-space low pincer is relatively uncommon in modern Go. It is usually played in relation to other stones in the upper right. Nevertheless it is a severe pincer and White seldom choses to play tenuki. As a result, most cases where the diagonal attachment joseki arises start with a White invasion into a 4-space low extension by Black. 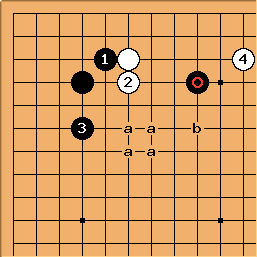 This normally implies that the extension is facing some White stones in the upper right since the 4-space extension does not usually fit as a connecter between two Black corners. There is not enough experience in professional play to draw any conclusions on how White should best proceed. At there are only one or two examples of each play (4, a-e). The choice will always be made in relation to the other stones on the board. It is clear that White's strategy must be to run out and/or pressure the pincer stone. There is not enough room for White to settle herself at the top. The marked Black stone is not a common extension from the 4-4 stone. As a result, most occasions where this arises are when White ignores the two-space high pincer. This pincer is more often played when White holds the upper right than Black. As a result, the most frequent play after the exchange of for is to approach from the right at or adjacent points. Black and White are likely to run into the center side by side. 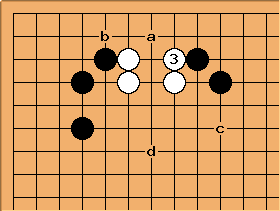 If White runs out directly, Black will most likely jump out in turn but may decide to extend along the top instead if there is enough room. The three-space low pincer has a long history. However, there is little professional experience where White chooses to ignore the pincer. 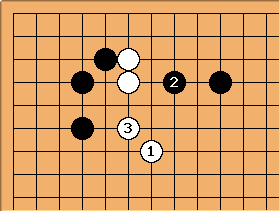 The above position rather arises most of the time when White invades Black's five-space extension. is by far the most common reply. Although there is space for White to extend to b, it is rare that White will choose to do so. There is no good next play for White since the marked Black stone is low. It is most common that White will choose to play from the right around (since most often White invades in this way when the Black extention faces a White position in the upper right. If White does not play from the right, she is most likely to lean on the Black stone with one of the points marked a. Many people have contributed to this page. In March 2003, Dieter rewrote and rereferenced the page. In April 2006, unkx80 reorganized and expanded the contents.